← Why Are So Many Lesbians Getting Pregnant? She’s become one of the world’s most well-known icons. The rolled up sleeves of her heavy denim work shirt. Her slender arm flexed, fist clenched in an unmistakable “don’t mess with me” pose. Her factory employee button alongside her finely manicured nails. Her hair bundled up in her trademark bandanna, crowning her very pretty and meticulously made up face. She’s at once hard, strong, beautiful and unmistakably feminine. But she’s not who you think she is. Not at all. And the New Yorker’s historically incorrect use of the poster and misappropriation of the woman herself is an insult to women’s history. Let me tell you her story. She was created in 1942 by artist J. Howard Miller who produced her under contract for Westinghouse. It was one of a series of posters, each used as motivational tools for Westinghouse employees to boost team spirit, factory productivity, and safety and also avoid strikes. The directions to shop managers to “Post Feb. 15 to Feb. 28” appear in its bottom left corner. Thus it was seen for only two weeks, exclusively by Westinghouse employees of its Midwest operations. It was unknown to the public until the mid-1980s. She is not actually Rosie the Riveter. Westinghouse didn’t rivet anything. The Rosie that people knew and loved at the time was Norman Rockwell’s “Rosie the Riveter.” (Note her halo, her curious “man arms” and the title of the book she is crushing beneath her foot.) She was even feted in this snappy and popular tune. The “We” in “We Can Do It!” is not a collective, feminist “we.” “We” was the corporation’s male and female employees. The “It” was meeting the order quotas for each factory, each day. Her flexed arm and clenched fist? It was certainly not a revolutionary symbol of strength and feminist empowerment. It was part of Westinghouse’s daily corporate cheer to stoke morale. Westinghouse Magazine (September 1942) featured a picture of such a rally with the explanation, “With ‘Let’s Show Them’ as their slogan and a clenched fist as their symbol,” the team readies for their duties. Rosie has been grossly misappropriated. She was no feminist, to be sure! She was only so in that she expected full and equal pay for a full day’s work. But she was first and foremost a dedicated patriot, standing in while her husbands and boyfriends were on the Front. Her desire was to earn a living for her family and help her men come home safe and soon. Nobody, even the most traditionalist of her day, thought she was transcending or redefining femininity by doing this sort of labor. Yes, she was happy for the work, the education and independence it provided. She changed the working world for her daughters and granddaughters, to be sure. But the only message she was interested in sending was to the Axis powers. Her only stand was for victory. She was indeed strong, capable, and dedicated and did not shrink from the difficult challenge. The millions of women who became Rosies were true national treasures, and the Great War likely could not have been won without them. Her British sisters did the same, as did her mother and grandmother in WWI. 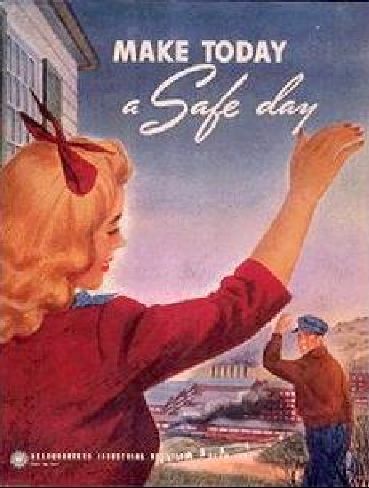 Today’s understanding of the poster and its message are for the most part “mythic” …[W]hile the words in “We Can Do It!” may appear to emerge from a female source, the image’s beauty and elegance conceal the fact that it is a ventriloquist’s voice commissioned by Westinghouse, a voice whose purpose was evidently [corporately] masculine and perhaps even exploitive. That poster was replaced on the factory floor by this one of the same series by the same artist, just the opposite of any feminist ideal. These scholars conclude the “poster has come to represent a past that never was.” Most of these patriotic and self-sacrificing Rosies would not care for the way they have been coopted by the more radical fringes of the feminist movement today, particularly the New Yorker’s historically dishonest use of her. This is who she was, here, here, here, and here. She signed up for and succeeded in a great national cause. It’s incorrect to sign her up for something she was never about. She was not a revolutionary idealist, but a patriotic realist; head down, working hard for her family and country. Rosie was a well-behaved woman who made history. Let her be what she was. 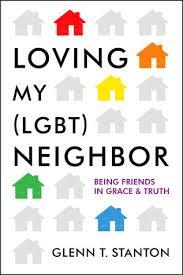 This entry was posted in cultural analysis, culture, feminism, politics and tagged feminism, New Yorker magazine; New Yorker, radical feminism. 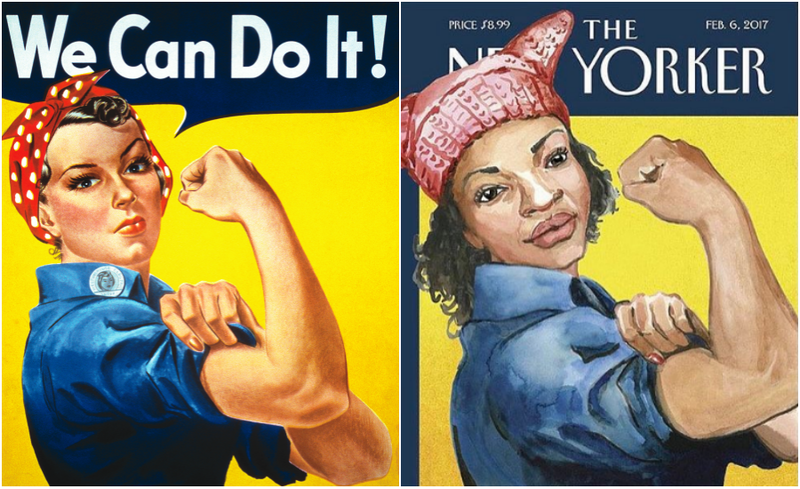 World War Two, rosie the riveter, the new yorker, World War II. Bookmark the permalink. 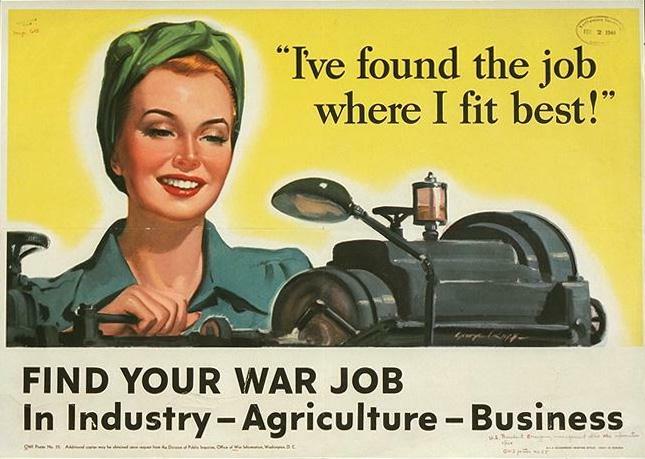 Women being brought into the workforce where they were otherwise oppressed from, having an important role in contributing to the war efforts and being given equal pay most certainly are examples of positive change towards feminism. The original art work’s intent, a call for productivity, even if not a call for feminism, is certainly not an insult to women’s history as you suggest. Regardless, by many peoples’ interpretation, it undoubtedly represents the notion that women are valued and capable. Since resurfacing in the 80’s it can be credited with inspiring countless girls and women that “We Can Do It!” (whoever we and whatever it might be). With your concern that this poster is being used to symbolize something it was never intended it would thus follow that the women who it might be perceived to represent are no longer affiliated with its modern-day meaning either. Still, I would speculate most would not have shied away from the concept of equal opportunities for all genders, had it been proposed as an option. The intent of the poster perhaps was not political in its original and fleeting distribution. However, we are not disadvantaged to now see it and its woman subject (by whatever name she is referred to) as an icon of feminism. This is not an insult to women’s history but rather symbol of the movement; a movement that is often misunderstood and sadly not wholly accepted by society even three quarters of a century later. I disagree Athena. Not only with what you say but the angle of this article. Yes, Rosie the Riveter is an entirely misleading “icon” be it of feminism or any social movement. And it most certainly has no place in today’s radical, meaningless feminism of which anyone aware of true trends, only demonizes, demoralizes, and discriminates against men. 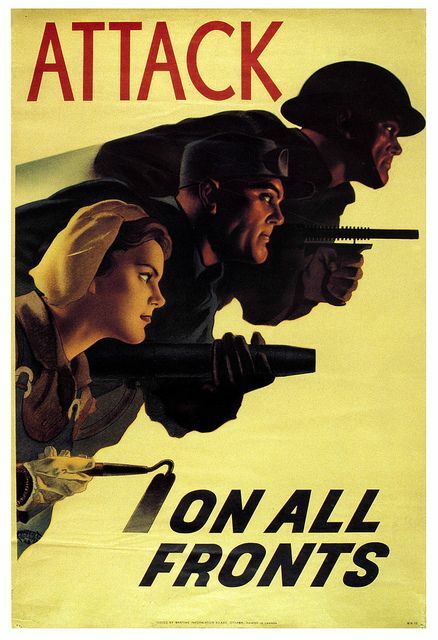 The poster is foremost war propaganda. It is WRONGLY used today in the unwarranted “empower women” movement. Unwarranted because in reality, more girls are attending college today than boys which is NOT “equality,” we have enjoyed decades upon decades of workforce equal to men and there is no price tag on LIFE itself, so men today do not belong at war more than any women. 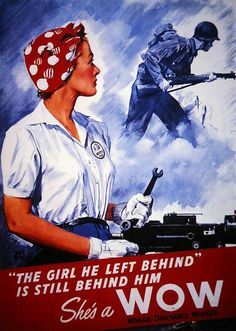 If women want a role in the so-called “war effort” only building up USA’s self-destructive war economy of which many sons are no longer taught to glorify, then join the “effort” in the battlefields and send your daughters. Some of us are not angry cynics or ignorant enough to believe in war as a “service and sacrifice” and can see right through the political rhetoric. Girls today are unfairly dished out special privileges in high schools across our nation for free STEM programs, free financial management programs and other areas with the irrational and misleading reasoning “technology is male-dominated” or that females for whatever reason need a leg-up with finances. As a woman myself that grew to executive level in the high tech space, I can tell you firsthand that even if tech is more men it simply does NOT matter nor give reason to exclude boys today for these programs. It’s downright discrimination based on nothing but false perceptions. Rosie is as immoral as “Captain America.” Both mere war propaganda tools. Interestingly enough, the high-tech world itself, though it does lots of good stuff, is a double-edged sword. The internet was started by a “defense” agency on the dark side keeping us in perpetual wars for profit. Turns out, Rosie was speared as a pawn for profit. the boys should be as well. Please don’t use this poster as an icon for “female power.” It’s disgusting.